Fall is officially here! There are so many things that I love about the fall. The colors, the weather, the leaves, the clothes, and the pumpkins, OH, the pumpkins!! I love the way they look, the way they smell (unless they’re rotting on your porch) AND the way they taste. So today I thought I’d share some craft tutorials that I’ve stumbled across recently that are inspired by those oh-so-autumny, fun, orange pumpkins. Here’s a quick and easy project that you could use to decorate your home, desk or even use as a centerpiece. No sewing involved! I’m thinking about modifying this project to do with my kids at school. One of my favorite crafty bloggers, Delia Creates, did a guest post on Project Run and Play. Two awesome blogs combined? Win! You could sport this as a casual costume, use it to top off a full pumpkin costume, or if you’re just that hip, you can wear on a regular day as a autumn accessory. And she shows you how to make a witch’s hat and a sunflower too. Based off the traditional tomato pincushion, Ellen from The Long Thread, created a functional and adorable pumpkin pincushion. I’d love to have this lil guy sitting next to my machine year round! These make equally sweet decorations if you want to gift it to someone who doesn’t sew. This craft is so sweet and simple, I bet you can whip up a whole pumpkin patch in no time. It’s another great project to do with kids, too. 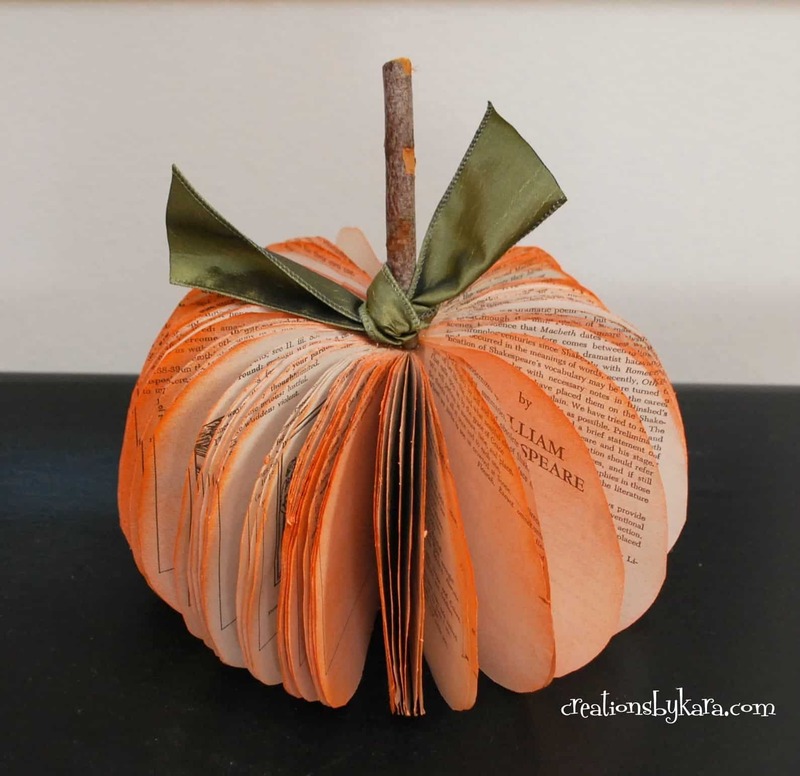 Here’s a fun way to repurpose an old book. I don’t know if I have any that I’d be able to part with, but if you have an outdated dictionary or something, you could probably make several! Anyways, I hope you have fun with these crafts. It’s nice knowing that there are tons of fabric and paper crafts, and a lot of them don’t require any sewing! The materials are pretty basic too – you might even have everything in your home already! If you find any other awesome fall crafts, please share them with me! This entry was posted in featured and tagged autumn, crafts, decorations, fall, featured, pumpkin by Cherie. Bookmark the permalink.